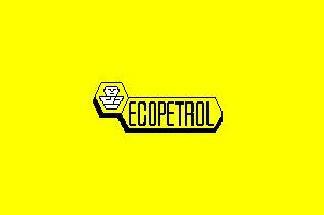 The company was established as Troco (Tropical Oil Company) in 1921 and then in 1951 it evolved into what is known today as Ecopetrol S.A., the biggest state-owned company in the country. Currently, the company uses two flags officially, as seen here (Source: http://www.ecopetrol.com.co/especiales/manualIdentidadECP/bandera-corporativa.htm). http://www.ecopetrol.com.co/especiales/manualIdentidadECP/descargas.htm, http://www.ecopetrol.com.co/especiales/manualIdentidadECP/construccion.htm and http://www.ecopetrol.com.co/especiales/manualIdentidadECP/variantes.htm) in the middle on a white background. No date of the flag change can be traced so far. The company was established in 1951. Flag of Empresa Colombiana de Petróleos ECOPETROL. 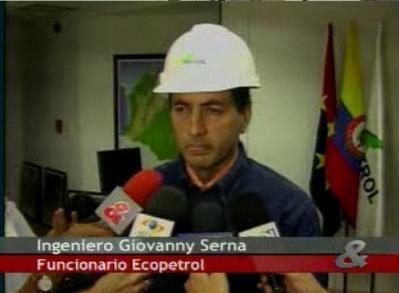 The company Ecopetrol seemed to use a variant of the flag displayed here. The variant is the same flag as above, only with a tricolor insertion (yellow, blue, red) on the top left corner (Source: http://www.verfotosde.org/colombia/imagenes-de-El-Calvario-29156.html) resembling the national flag. The FND (Federación Nacional de Departamentos, National Federation of Departments) is the organization that encompasses all 32 Departments of Colombia, with the purpose of Territorial Autonomy as a strategy for national development thrught the wealth of all the regions, promoting coordinated descentralized policies. It was established in 1994 during the VIII Cumbre General de Mandatarios Seccionales (General Summit of Sectional Leaders) held in Popayán. 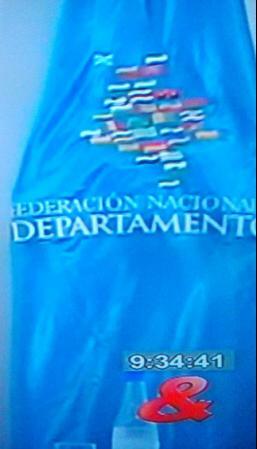 The flag is the logo on a blue horizontal flag with the inscription below that reads "FEDERACIÓN NACIONAL" De and on the next line below "DEPARTMANTOS", all in white capital letters. The logo features all the 32 Departments' flags (pretty much like this image) in the shape of the Colombian territory. The flag of FENACON (Federación Nacional de Concejos), or Councils' National Federation. "Council" is the Legislative Branch of government in a Municipality in Colombia, and the Federation is the gathering of the councilmen of (so far) 623 Municipalities' Councils. Image is baed on photo taken from the official website of the Colombian Ministry of National Defense. In the photo there is the Colombian Defens Minister Juan Manuel Santos as he appears in front of the Colombian flag (left) and the FENACON flag (right), togheter with FENACON's current President Mauricio Tobón, who is also the President of Medellín's Council. FENACON official website is at <www.fenacon.org>. The flag of the Fiscalía General de la Nación (nation's General Attorney). Official website at <www.fiscalia.gov.co>. The purpose of the "Fiscalía" (as it is widely known locally) is to investigate crimes and qualify the judicial processes before judges and tribunals. The logo, a puzzle piece, is oficially called "Pieza clave" (it could be translated as "smoking gun", or main proof) and it was created in 1996 (see <www.fiscalia.gov.co/entidad.html#logo>. The image is based on the actual Fiscalía flag taken form the official website. The emblem of the Fiscalía General de la Nación (Nation's General Attorney) was designed by Góndola company in 1996, as reported by the Colombian magazine ProyectoDiseño. This magazine is the most important magazine in the Country for Design and Architecture. The Fiscalia was established by the Colombian Constitution of 1991 and began operating on 1 July 1992. There is a Colombian government company called FONADE (Fondo Financiero de Proyectos de Desarrollo- Financial Fund for Development Projects). It depends on the DNP (Departamento Nacional de Planeación, or Nationa Planning Department). The DNP stands at the same administrative level as DAS for being an Administrative Department within the Government. The DNP is in charge of the strategic economic and social planning of the country, as well as the management of the sources and resources to execute such projects nationwide. The FONADE has the main task of managing development projects in the early stages, supporting the project through financig, advisory, administrative research projects, grants credits, as well as supports for scientific, technological and environmental activities within a specific project. It is mostly a development agency. 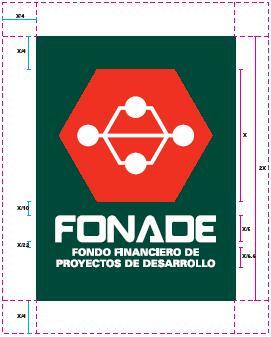 For the emblem of FONADE refer to the corporate image manual, where a detailed 18 page document ellaborated in 2000 shows the uses and misues of the FONADE emblem at <web.fonade.gov.co>. The FNA (Fondo Nacional del Ahorro) (Savings National Fund) was established through Extraordinary Decree No. 3118 of 1968 to manage the severance pay of public employees. By Law 432 of 1998 it was transformed into a state-owned company. 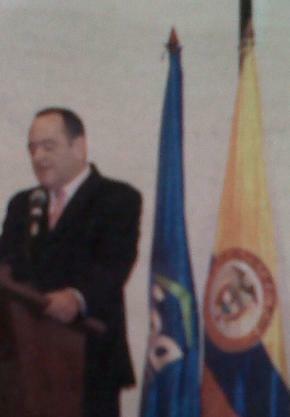 On June 8 in a local newspaper edited by the FNA (Fondo Nacional del Ahorro, Savings National Fund) its flag can bee seen in a picture during a conference by its current President. The FNA is a government entity established by Extraordinary Decree No. 3118 of 1968 to administer public employees' layover/vacancy funds, and through Law 432 of 1998, its scope of action was broadened to also receive and manage also private layover/vacancy funds. The flag of the FNA is a plain blue horizontal background flag with the FNA logo in white letters, and below it reads "Construyendo Sociedad" ("Construyendo" in light greens letters, and "Sociedad" in white letters, as seen here. The current FNA flag has been most likely adopted between 2010 and 2011 dating from the previously mentioned former logo flags, which date from 2010, and their online newspaper, which was established in 2011 and already shows the new logo (and thus the new flag). For additional information please see: FNA (official website). The Hospital Meissen (full name E.S.E. Hospital Meissen), Meissen Hospital (E.S.E. stands for Empresa Social del Estado, Social State Company), was established (according to the website 43 years ago, which in 2012 means that it was created in 1969) as a Kindergarden. Then by Agreement No. 17, 1997 was established as Hospital Meissen Level II, by the Council of Bogotá. 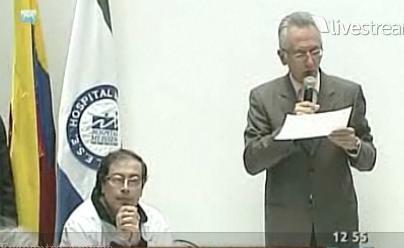 Thus, the hospital is currently public property, operated by the city authorities of Bogotá. The flag is a horizontal flag, equally divided into three horizontal stripes (navy blue/white/navy blue) with the logo in the middle.